Fitting is true to Western cut shirts and blouses. Tailored for reaching around your partner, or throwing ropes, without binding in your shoulders. Longer tails that don't pull out so easily. And You will enjoy other benefits you will appreciate more and more as you get used to being spoiled by your cowboy shirts. 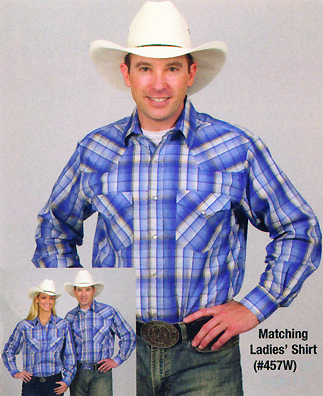 Western ranch shirts are some of the best value priced shirts in the world. Great looks at an affordable price range. The regular fit is tapered slightly for comfort. Tailoring you would normally pay twice this price for, at a fine clothier. Ready for work, at home or on the ranch. Complementing "Pearl snap" closures. 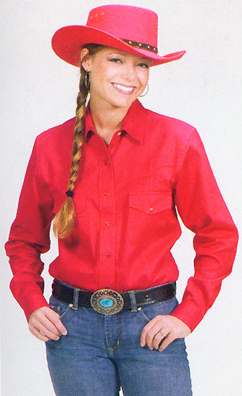 With front & rear yokes, double flap covered chest pockets, and multiple sleeve adjustment snaps, you will come to love this Western shirt favorite. Men's matches for all but the pink. 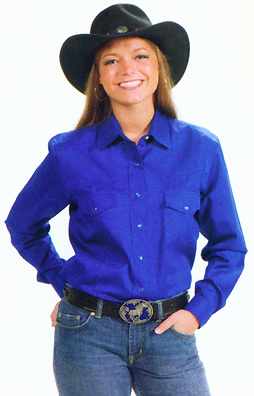 Denim base with Western favored points of fashion. Yoke adds detail and protection from weather. Snap closures. Long tails. Tailored fit. 100% Cotton. A perfect work / party shirt. Black base with Western favored points of fashion. Yoke adds detail and protection from weather. Snap closures. Long tails. Tailored fit. 100% Cotton. A perfect day or evening shirt. Red base with Western favored points of fashion. Yoke adds detail and protection from weather. Snap closures. Long tails. Tailored fit. 100% Cotton. A perfect day or evening shirt. Pinbk base with Western favored points of fashion. Yoke adds detail and protection from weather. Snap closures. Long tails. Tailored fit. 100% Cotton. A perfect day or evening shirt. Royal Blue base with Western favored points of fashion. Yoke adds detail and protection from weather. Snap closures. Long tails. Tailored fit. 100% Cotton. A perfect day or evening shirt. 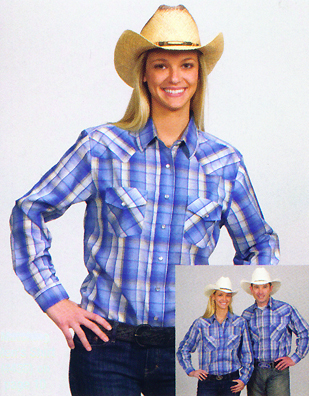 Plaid cowgirl shirts just seem to be a staple in the closets of most ranches. Twin single point snap pockets and yoke are set on distinctive angles, as has been tradition for Western Fashion shirts for 'bout 100 years or so. Poly cotton makes the fabric fairly strong, while being thinner than 100% cotton in weight. Blue/Cream shades base. Blue & gray toned highlights. Western favored points of fashion. Yoke adds detail and extra protection from weather. Snap closures. Long tails. Tailored fit. Poly/ Cotton. A perfect work or casual dress shirt. Blue/ Cream shades base. Blue & gray toned highlights. 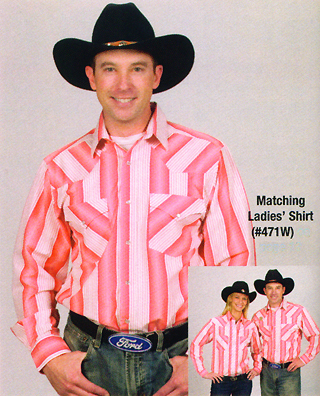 Western favored points of fashion. Yoke adds detail and extra protection from weather. Snap closures. Long tails. Tailored fit. Poly/ Cotton. A perfect work or casual dress shirt. 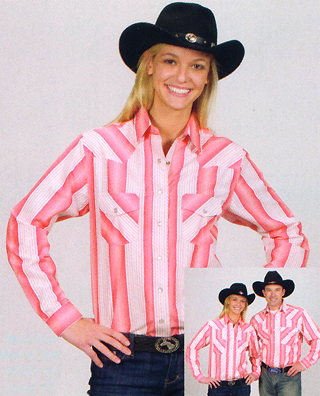 And stripe cowboy shirts just seem to be another favorite in the mindset of most "hands". Twin single point snap pockets and yoke are set on distinctive angles, as has been tradition for Western Fashion shirts for 'bout 100 years or so. Poly cotton makes the fabric fairly strong, while being thinner than 100% cotton in weight. Light base. Softened red stripes. Western favored points of fashion. Yoke adds detail and extra protection from weather. Snap closures. Long tails. Tailored fit. Poly/ Cotton. A perfect work or casual dress shirt.